Most people understand what a foreclosure is. If payments are in default on the mortgage, the bank will foreclose. But many people do not know what a short sale is. A short sale is the sale of a home for less than the current balance of the mortgage. Banks are agreeing to accept less than the balance of the mortgage balance when a home is sold at current fair market value (FMV) all around the country. The short sale process has been chaotic at best, and a nightmare at worst. Homeowners who want to sell their homes don’t know how to do a short sale, so they price their homes so they will net zero, but for many homes that is still over priced, which means the homes simply don’t sell and ultimately go into foreclosure. You might say, “Well, Realtors know how to do a short sale, so I’ll list my home with a Realtor.” Nationwide very few Realtors know how to do a short sale. The problem has been that there has not been a standard for the forms and information required by a bank, nor has there been a bank standard for the requirements to approve a short sale. The result is that attempts to do a short sale have been frustrated by chaotic procedures around the country, inconsistencies in the process, differing standards among banks, loss mitigation departments without clear guidelines, and Realtors who have all but given up trying to get short sales through. If you have a home you need to sell, and you expect to net zero anyway, and if it does not get sold fast you will end up in foreclosure, you ought to get serious about doing a short sale. I recommend two things. 2. Use the most powerful short sale engine in the U.S. What is this short sale engine? It is an entire online short sale software system that will help you organize and manage the entire short sale process from beginning to end. It includes all the forms and letters, and allows each participant to log in and play their part. That means your Realtor, your bank (and their loss mitigation department), the buyer, and an attorney (if you or your buyer have one) can all login and facilitation an efficient and quick short sale. My associate is getting 85% of her short sales approved, which is unheard of across the country, and some of these transactions are getting approved within a matter of two weeks. 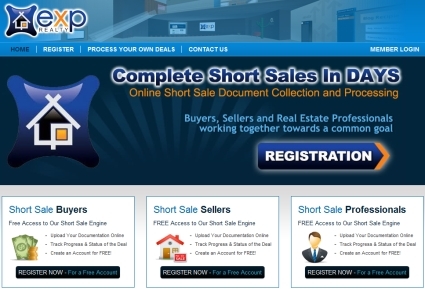 This is the single most powerful software to get a short sale approved. You can use this short sale engine online now no matter where you live in the United States. The database connects to banks around the country. Go to Nationwide Short Sale Engine. If you live in the Sequim or Port Angeles area, I recommend you hire me as your Realtor and we will use this short sale engine to get your home listed and sold quickly and get the short sale approved with your bank quickly. You can go to SequimShortSales.com or PortAngelesShortSales.com. There are potential tax and credit score consequences to both foreclosures and short sales. Foreclosures are often done as non-judicial foreclosures, but banks are also doing judicial foreclosures to obtain a personal judgment, and short sales have potential taxes on the amount of the mortgage forgiven, although legislation may eliminate that issue. For tax and other financial advice, I recommend you consult your tax account or see an attorney for legal advice. Time is of the essence if your home is upside down or is approaching a foreclosure. A short sale may be the best answer to get your home sold quickly. One Response for "Foreclosure or Short Sale?"